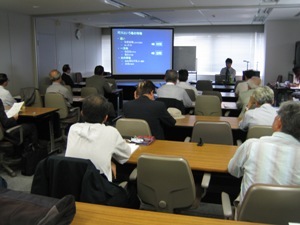 On Wednesday, May 13, 2009, JRRN hosted the Third JRRN Mini-Seminar, the “Endemism of Asia Revealed by Environmental Flows.” ARRN Technical Committee Member Dr. Shirakawa gave a lecture, and the JRRN Secretary explained the “Reference Guideline for Restoration by Eco-Compatible Approach in River Basin ver.1” There was an active exchange of opinions with participants. Dr. Shirakawa gave a lecture concerning the concept of environmental flow and their setting methods, as well as relations between rivers and civilization in Asia, using the keywords: change and disturbance, and explained the concept that helps to address river environmental restoration. The JRRN Secretariat explained the process involved in the writing of the guideline and its basic ideas, and reported on the collection of case examples of river restoration, which was carried out in parallel with the writing of the guideline. 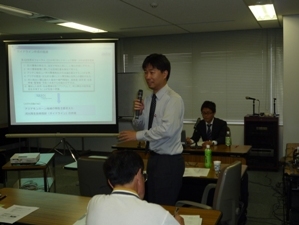 In an exchange of opinions after the lecture, some asked questions about the definition of the term “environmental flow” and its historical background, while others gave precious opinions concerning the future development of the “Guideline.” The discussion was meaningful for future efforts for river environmental restoration.